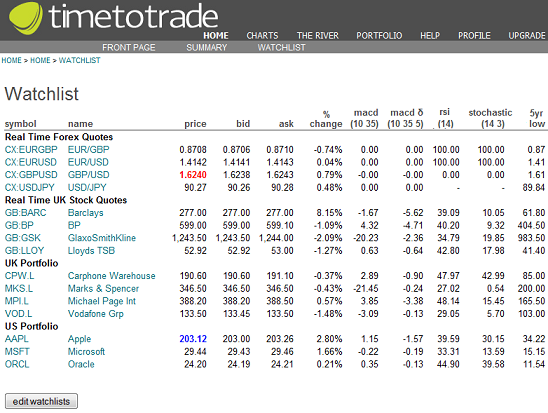 Track stocks, ETFs and Forex prices with timetotrade's fully customisable watchlists. You can create multiple watchlists for companies listed in the US, UK, Singapore and Indian stock markets. In addition to stock prices, timetotrade also provides FREE real-time quotes for forex and FREE real time prices for most UK shares. You can even customise how the daily change and daily % change are calculated in your watchlists: either based on the previous day's close price or you can select to use that day's opening price instead.